Alright. The title is a little dramatic. I get it. However, there are moments in life when the passing of somethinggg can hit you hard. Perhaps, albeit, not as hard as the loss of a pet or person – and rightfully so – because it’s just a thing. I got sober in 1988. My whole attitude and outlook upon life was changing. A transformation was taking place. I was mostly discovering happiness and I’ll never forget the meeting I was sitting out front with friends in San Jose, California. They smoked, I chatted. 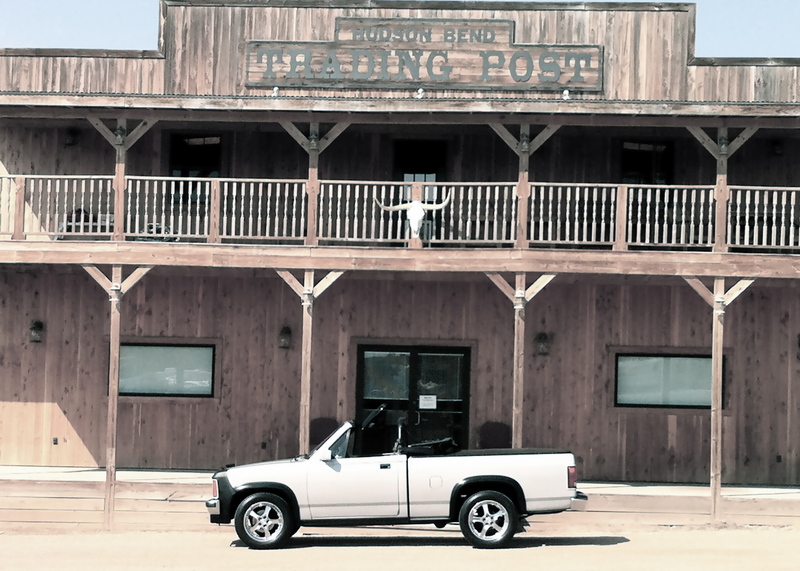 Rick Cornelia pulled up in a brand new-for-1989 Dodge Dakota Sport Convertible Pick up Truck. It was red. Now, I’d already long since started my love affair with convertibles. I was currently still driving my first one. America stopped making convertibles in 1976, when the “last” Cadillac Eldorado rolled off the assembly line. Auto makers thought the convertible was doomed because of high insurance rates, poor safety perception and declining interest. When Chrysler reintroduced the convertible in 1982 with the K Car. Not long after that I was in the Navy stationed in Detroit, Michigan. My 1983 Convertible. A Dodge 400 I bought on the spot. While driving through Detroit, these Chrysler convertibles were new! And precisely, just like this white one you see above, with red interior, white walls and hood ornament is exactly what was sitting on the lawn of a dealership. They had placed sand around it and umbrella. The mannequins around it made it appear that they were having a lovely day at the beach. This was Detroit. I looked left – I looked right. No beach here. But it reminded me how homesick I was for California and I drove right up, practically on the sand next to it and asked the salesman how much. $6,200. “I’ll take it!”. It was that car I was driving when Rick pulled up in that convertible truck that spring day in 1988. I loved my Dodge 400 and had no desire to part with it. 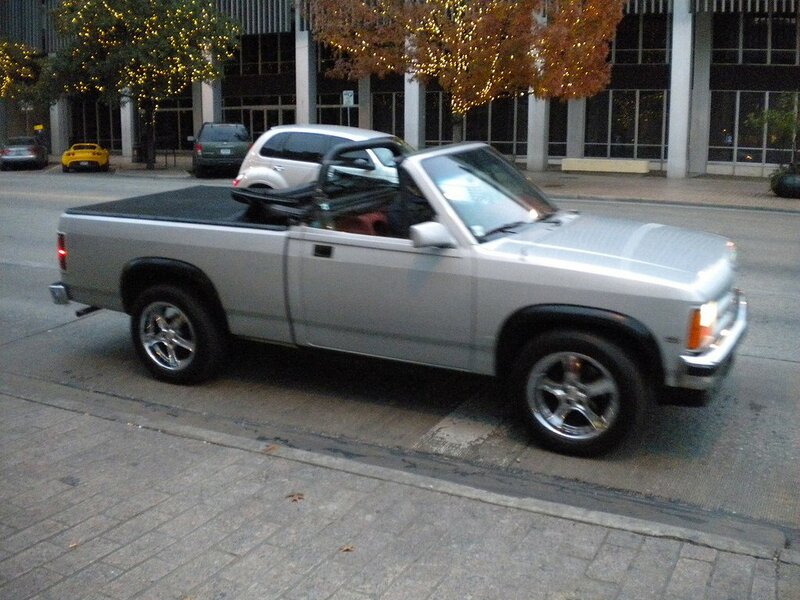 But, I remembered that truck, such an oddity – a convertible truck! And, I vowed I’d get one someday. What I didn’t know was how rare those trucks were to become. Chrysler only made about 3,000+ of them. And, many years later, when I tried to search for one – it was difficult to find. You never saw them on the used car lots and so I mostly let it go. I drove other Chrysler convertibles instead. I’d been searching on and off for years when just down the street, a neighbor pulled one out of his garage! It was beat up for sure, but there it was! This was 2006 and I squealed when I got home and said I’d found “it”. The neighbor placed a for sale sign on the truck. I had driven by it for months wondering why it merely sat in the driveway and now here it was for sale! I gave it half as much thought as I’d given that first convertible on that sandy dealership lot. Which is to say NONE. “I’ll take it!”. 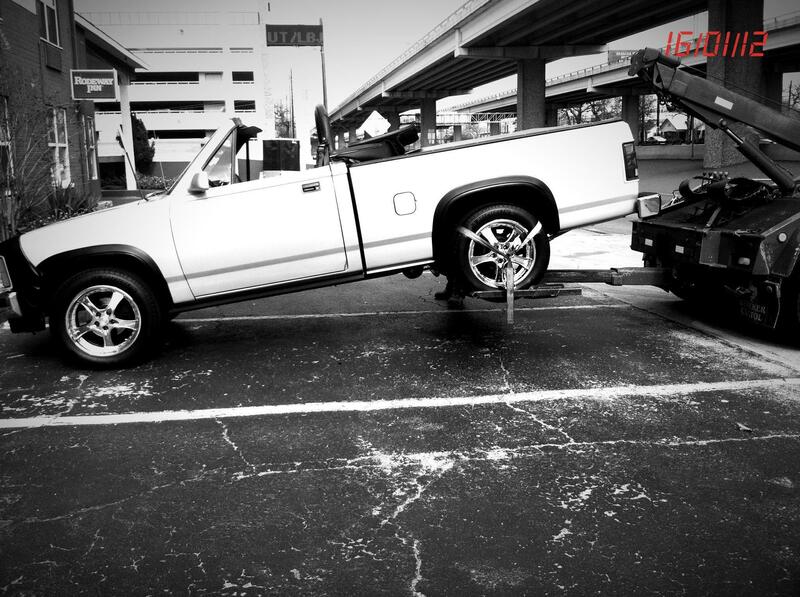 To say Rob was perplexed when I brought the truck home is a kind way of saying… he was mad as *#@!. My direct assignment from Rob was to get rid of all the cars (I could keep one). Rob declared it one of the ugliest trucks ever. How could you say that about anyones baby? Truth was it was somewhat worse for wear. Bad paint, and original wheels that were pitted, and overall worn out look. 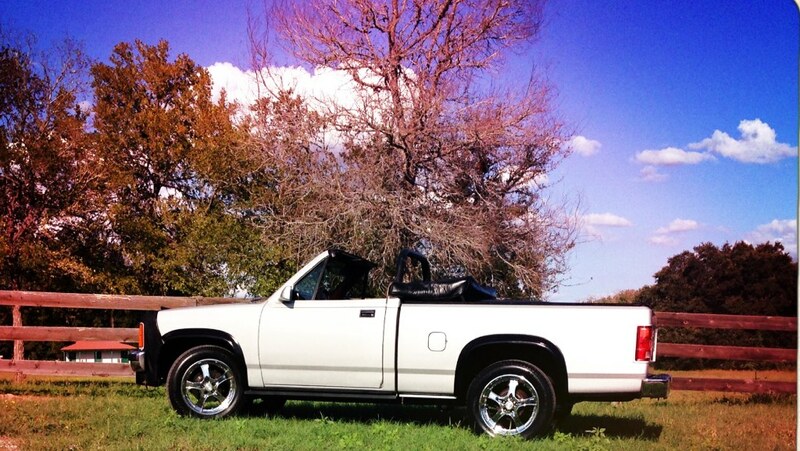 My beloved 1989 Dodge Dakota in its original condition. 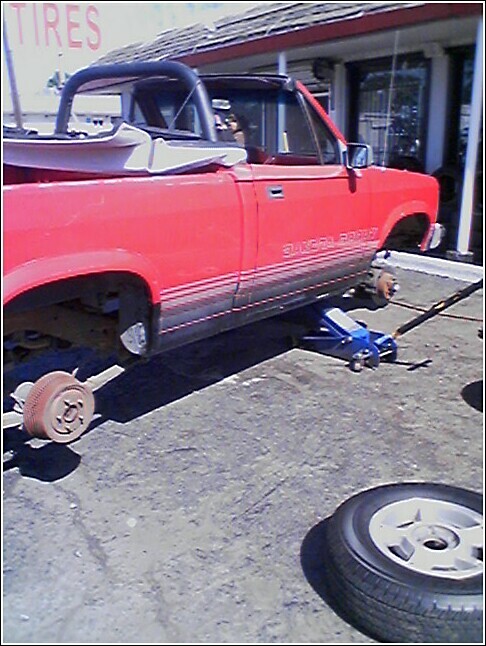 Here it is getting new shoes. The original wheels were pretty bad, but not as bad as the paint. 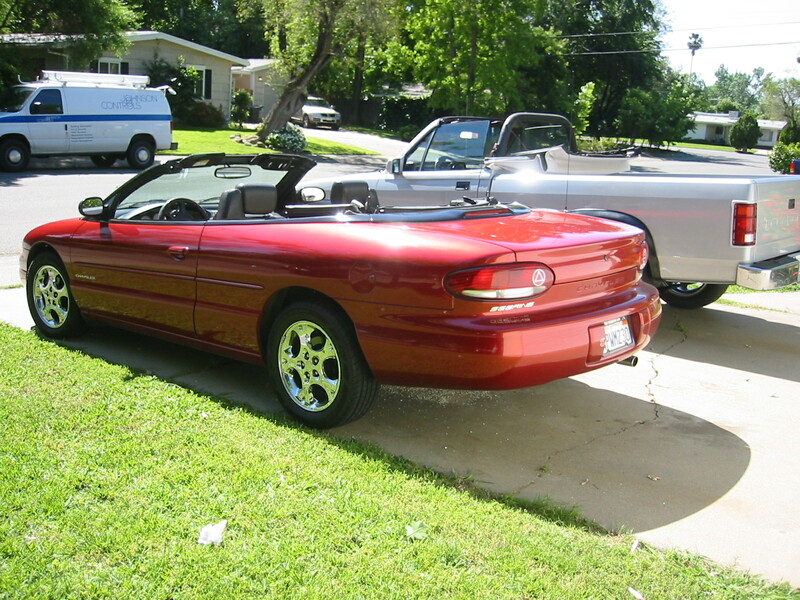 But like any crazed-convertible lover, I saw potential. I declared in a month, when we were scheduled to depart for Texas, he’d not recognize it. We started with new wheels, and a stereo upgrade. It was going to need new paint too. After the wheels and stereo and before the new paint. It was oxidized and red. Not a particularly pretty red either. I brought it home and parked it next to my other Chrysler convertible. They were beautiful together. I wanted to keep them both, but Rob said one, and the Truck wins. The truck always wins. The Sebring and the Dakota. Just fresh from the paint job. Silver and black themed, like the Raiders football team an homage to my brothers’ suggestions. We set out for Texas on a late May-day. We loaded what we could in the truck (way more than we’d ever fit into that Bug Convertible), and set out for our new life in Tejas. There were some delays. Our first introduction to the Lone Star constabulary was less than an hour into our Texas adventure. 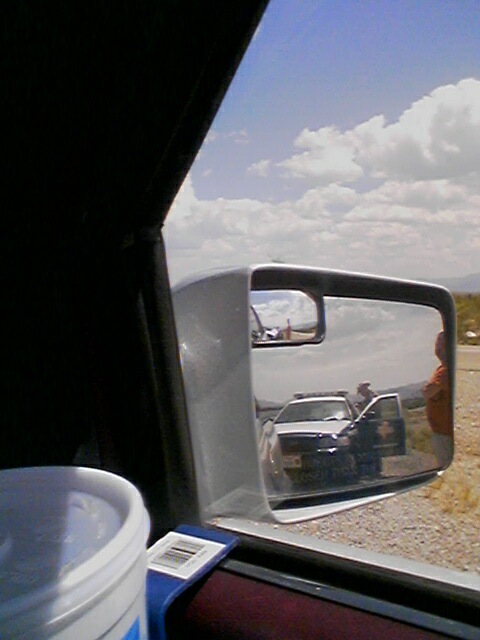 Rob was driving 90 miles an hour on Interstate 10. During the only hour I’d not drive on that trip. I was so mad when I found out how fast he was pushing my baby, I had no sympathy for him. I looked around for my own book to throw at him! I texted his photo to all our friends back home as retribution instead. 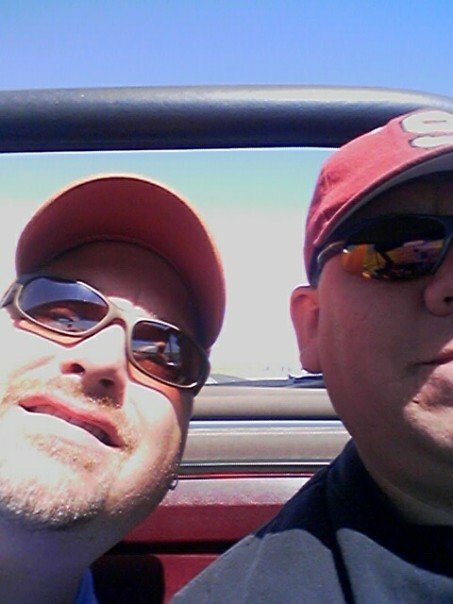 Rob and I, driving through LA on our way to Death Valley, Arizona, New Mexico and ultimately – Texas! Rob, driving the Diamond Dog Dodge too fast for any roads. Get him officer! It was the perfect vehicle for Texas! Many didn’t know Dodge ever made such a contraption. Of the 3k or so made, hardly any were sold in the Lone Star state. Most of them were in California, and Florida the rest spread throughout the south. Rob even grew to appreciate the practicality of something you could take to home depot and load with sod, and then put the top down and drive by Lake Travis and through the Hill Country on a lovely spring day. 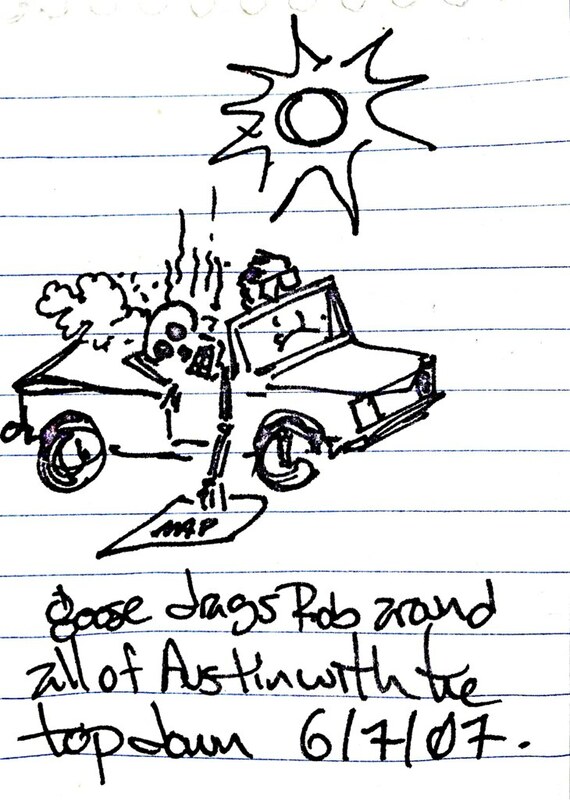 Although, admittedly, it was somewhat hot in Texas for top down driving as he illustrated for me once with a picture he doodled in a meeting. 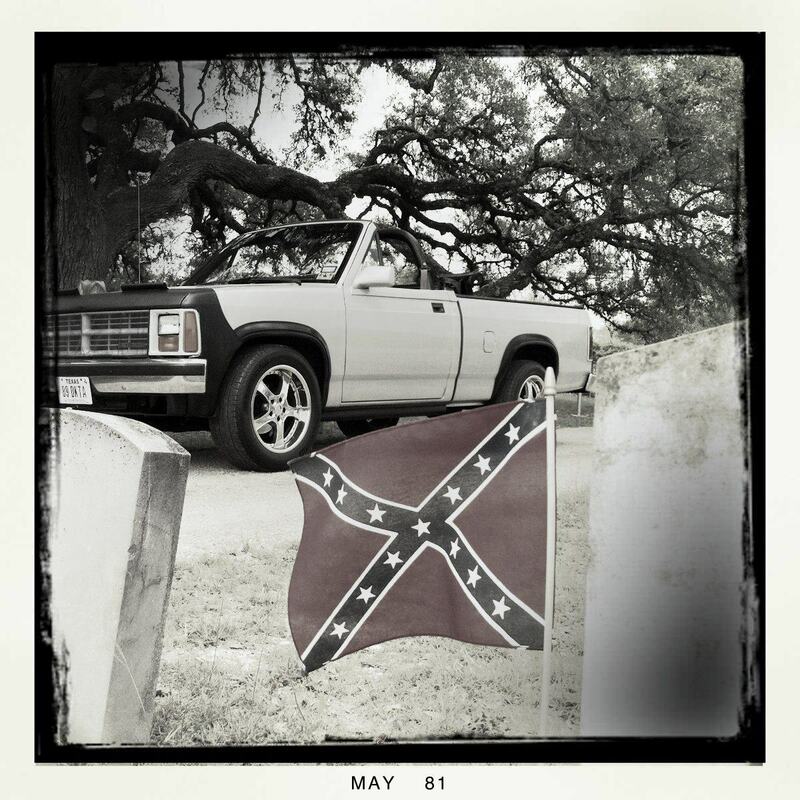 My introductions to my fellow Texans, in the beginning, until I started purchasing additional cars was me and my truck. While retrospectively somewhat dangerous to allow a thing come to define you or be so closely associated with your personality, this truck fit me perfectly. A little bit butch a little bit.. me. Hudson Bend, near Lake Travis Texas. A great day for top-down driving. And, I drove it everywhere, El Paso, San Antonio, Houston, Dallas. It wasn’t the most comfortable, but it was the classiest – in my mind – of all the cars I’ve driven (35+ at last count). I drove it to car shows and gatherings of gear heads through out the area and state. And it made me so mad that the Dodge never got the respect it deserved. This was primarily because most folks just presumed I’d pulled a ‘bubba’ and taken a chain saw to a random old Dakota. They hadn’t realized that this car was manufactured at an odd time in Chrysler history, when they were trying to follow GM’s model of brand-marketing-manufacturing. The circumstances that led to the creation of this unique truck, were not likely to be repeated again (well, until Bob Lutz when from Chrysler to GM and tried to recreate this formula with the Chevy SSR the only other truck, post Model-T to be a factory convertible). The Diamond Dog Dodge at the weekly Car Cruise in Buda TX. Everyone at Cabelas looked. Mostly odd looks, but looks nonetheless. The truck had its shortcomings. It’s the first classic car I’ve held on to and you can see how repair bills can start to mount (easily). It needed a new transmission. It needed new wheel bearings. It needed engine mounts, it needed, it needed, you get the idea. But through all that, I recognized how much joy it brought to have an interest and to go out and live life doing fun things in fun places. Isn’t this why I got sober in the first place? To insist on enjoying life. This truck represented my independence and I loved that it was around as long as my first recovery chip was. You couldn’t help just feel like a celebrity driving the truck. It garnered comments wherever I went. It became annoying to Rob, because when he’d borrow it, he’d have to memorize the script. ” Yes, it’s a Dodge Dakota. No, I didn’t chop it. Yes, they really did make them. I know you’ve never seen one. I don’t know why they didn’t sell many in Texas. No, I think they should have made a lot more of them too. Yes, it is pretty isn’t it. No, I’m not interested in selling it today. No, I’m not interested in selling it tomorrow. No, I’m pretty sure I’m not interested in selling it.. ever. Yes sir. Thank you”. Once I searched “Dodge Dakota Convertible” in Google searching for parts. Up came this photo of me driving down Congress Avenue at Christmas time. 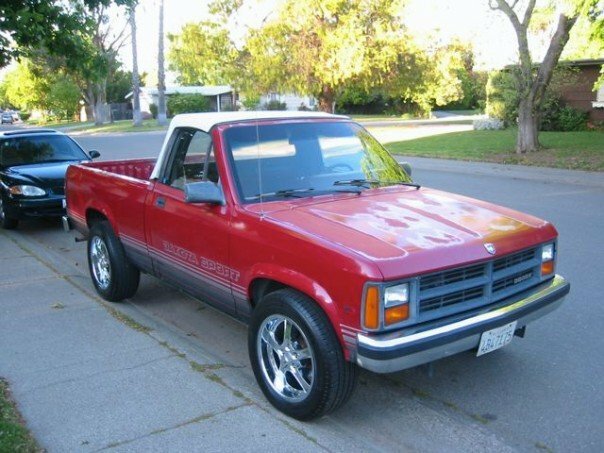 There were many more times I found random pictures of my truck on the internet. It was like that Drag Queen Leslie. This truck WAS Austin. She’s famous! In our time on earth we have milestones which remind us we’re finite, not infinite. Now that I’m in my 50’s I feel pains that I didn’t feel before. My neck aches. My ankles swell. and all these serve as a reminder that time is passing. I’ve seen my friends pass off the seen. Sometimes their life comes to an end, or sometimes a friendship just runs its course. But material possessions, in theory, continue on. It’s not like I’d ever ‘break up’ with this truck. Rob and I often jested that the order in the event of a fire was Rob you grab the dogs, the photo albums, the wedding silver, the wallets and phones and I’ll meet you at the corner, because I’ll be headed for the garage to move that truck! But the constancy of material possessions aren’t permanent. Even friends in the form of familiar surroundings change. Going home I see how the neighborhoods have evolved. And in AUSTIN – buildings that were once there, the Alamo Drafthouse South, the Trailers on South Congress, the numerous places to park downtown are all disappeared. And, so why wouldn’t something such as a truck be spared the ever evolution of change. But the familiar brings a sense of happy. Of continuity. Of permanence. And, change is an unknown thing. Change is .. scary. But not necessarily hard. Only resistance to change is. Every time I’ve walked through change, hand in hand with God, I’ve been spared the difficulty of fighting against it, the inevitable. In the end the Truck doesn’t always win. — Time does. Change does. Life does. The Diamond Dog Dodge is so named because it’s everything I love wrapped into metal. The preciousness of diamonds. The hugability of a dog and it is a Dodge, a Chrysler product – a brand I’ve always found a fondness for. It’s also, for reasons known to me and my husband and we smile when we think about how much joy this thing has brought me, and by extension us. I knew someday I’d have to let the Dodge go. But in my minds eye – it was when I was simultaneously handing over my drivers license from old age and infirmity. I didn’t know it would be just a month after I mused, “I think I should get special insurance for it.” It’s far more valuable than the number displayed on paper in a blue-book. A lovely Fall day outside of Bastrop Texas. I love taking a random drive on a fall or spring day and observing change, leaves, winds, evolution and life. So last week, when I had that slow-motion moment, I hit the brake so hard I may have fractured my ankle, and I saw the metal of my truck hit that car, I knew it was not a good thing. I didn’t know to what extent it was a bad thing. From outward appearances I had hope. A slightly bent fender. I little crush on the bumper. And a flat tire. I didn’t know that much like internal organ damage that the wheel had been pushed back into the frame and there may be frame damage. Short of the synonym of rust and cancer, there’s no more fatal diagnosis for a car than frame damage. Even an engine is more easily replaceable. So perhaps it may be time for it to pass of the scene and out of my life. And, maybe I’ll be ok. Maybe I’ll find a new interest and maybe these photos will serve as a reminder of fond days past, but not to the exclusion of fond days present or future. I’ll always remember my excitement the day I found “It”. 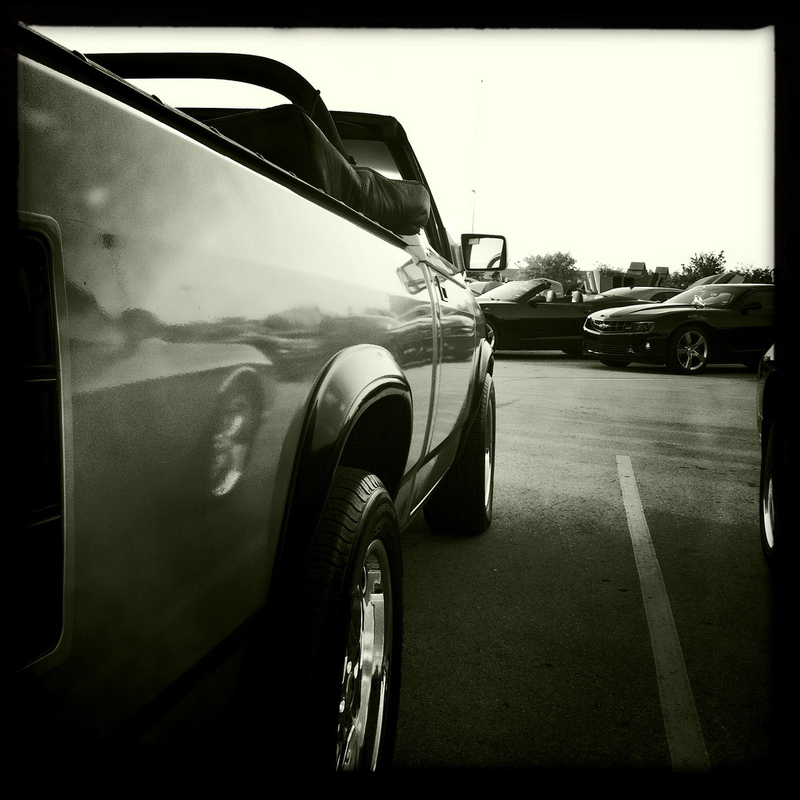 And how it bridged my California life and love of convertibles, to my Texas life and love of Trucks. It really was the perfect Texas truck. I hope some part of it is salvageable. But, I’ll survive if it’s not. But, for my heart, the Truck always wins.